I had a beer party last night. People who gathered were PC freaks. We met on the network about 10 years ago and have been having a party once or twice a year. When we met for the first time, the internet didn't exist and we were useing a PC online service, Nifty-serve, which was modeled after CompuServe in the U.S. I really think I was lucky to have known the PC online service because I could get many friends in many fields. Most beer gardens or roof gardens have a time limit and a fixed charge system. The time limit was 110min and the charge was 3600 yen per person in the ANA hotel. Within the time limit we can eat and drink as much as we like. It's so far so good. The problem is that the closing time was set there. They change all the customers at that time. The first group is from 17:30 to 19:20 and the last group is from 19:30 to 21:20. The time that the customers get to the seats wasn't the starting time. The starting time was already set and if we were late, we would lose our eating time. That is to say, so many people gather at one time in front of the table where dishes are arranged and have to stand in line to take their meal. 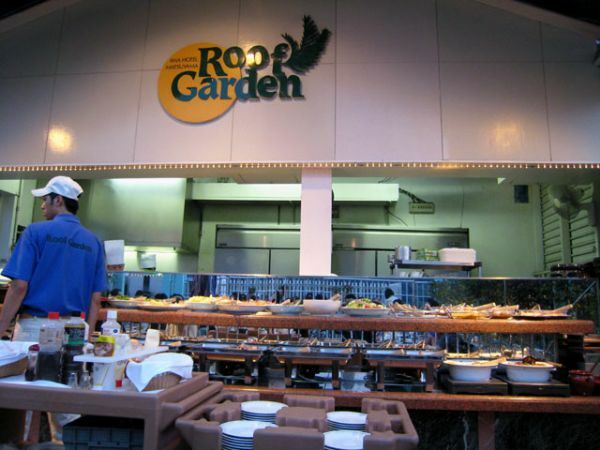 We got to the roof garden a little earlier, so we were OK, but some other groups that got in 10 minutes or so later had to wait about 20 minutes to self serve their meal. The dishes were good, but it is a real killer for thirsty people to wait for beer for a long time. Our table was the nearest one to the dishes and it was easy to get another helping. It might be due to the consideration that the hotel showed. Anyway we had a really enjoyable time. Time passed so rapidly and we moved to another Japanese-style inn and talked and drank to our content. It was the next day when I reached my home. I talked to nurses about the product for relaxing that I wrote about before. A nurse said to me, "Isn't that for drying pedicured toes? Your daughter is kidding you!" I thought that it could be so. My daughter often enjoys kidding me, but it is true that that intersting product is good for me. I often put it on when I spend time in my living room. It is comfortable to spread the toes far apart. 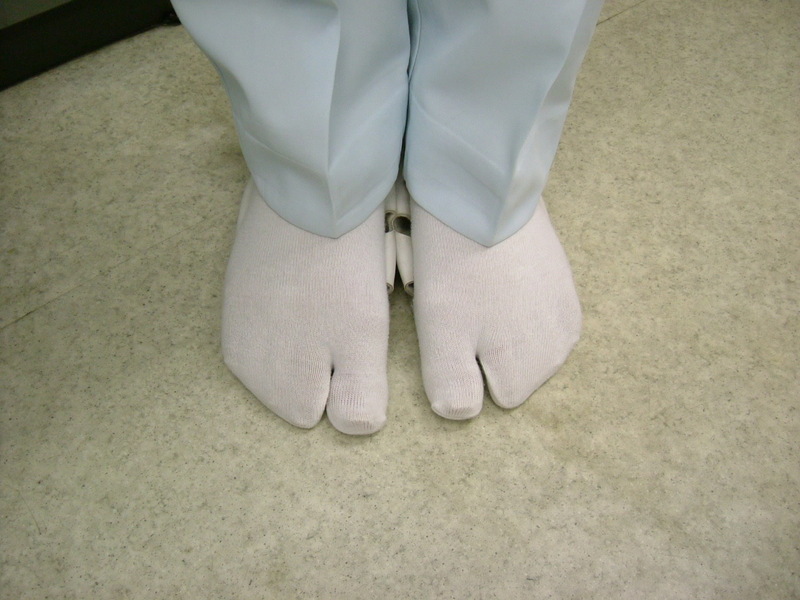 When we were talking, another two nurses were coming in and they showed me their socks. Their socks had toes and they told me that those socks are good. It might be the same feeling that I felt. I asked them to take pictures of their feet for this blog. 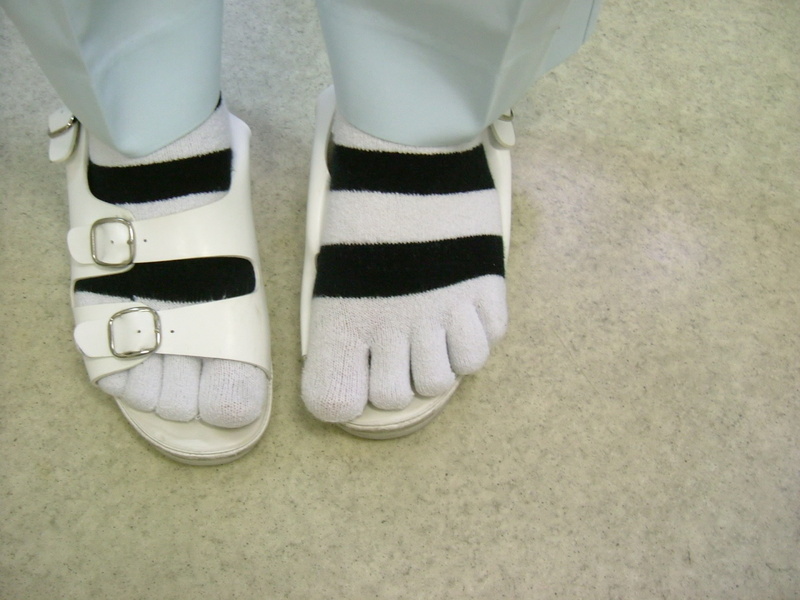 Are there such socks in other countries? Gardening is hard work for me. I don't like it though I'm happy to see the beautiful garden. When I had my house built 5 years ago, I asked a gardener to design my garden that could be maintained as easily as possible. I hoped for a maintenance-free garden at that time. I think you can imagine how bad I am at gardening from this story. By the way, it's getting hot and my dog Mocha seems to be feeling hot recently, so I got 3 potted trees, the Fraxinus griffithii as shade for his pen. They were leafy and the height and width of them was just what I thought was best. I put these pots at the east side of his pen and these plants worked well as a sunshade. It was just what I expected. I was satisfied with the effect of the plants. Nature surpasses art. These plants looked decent and beautiful. However...... These plants grew rapidly and the pots got too small for them. I had to change the pots to larger ones. This kind of work is tiresome to me. I don't want to do this, but I have to do it. 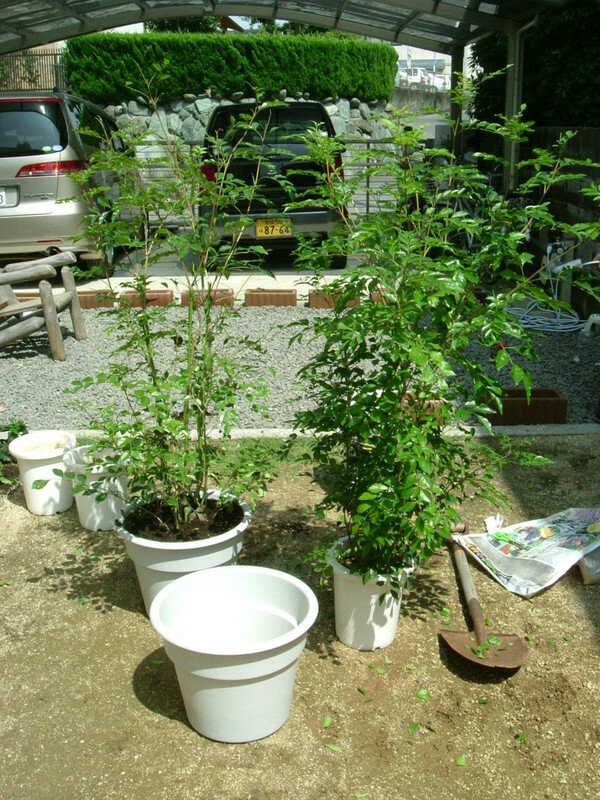 The picture shows 2 kinds of pots (small and large) and the plants. I got these large pots and soil at the nearest DIY store today. During work, I remembered a funny story. When I was a university student more than two decates ago, I sometimes visited the laboratory of the pathological department. One day I saw the professor giving water to the plants in his office. I told him with smile that taking care of bonsai (live miniatures of plants) or pottery meant that the man was near the end of his life. Actually I didn't have any interst in the plants and pottery at that time. The professor was gently smirking at me. He passed away a long time ago, but I felt that he is smirking at me again, "You too!" I realized that time changes and the way of thinking changes too. I can't believe I do so much garden work! I came to be the host of the beer party of people who are on the net. We have been having an annual beer party since 2000. The number of people will reach 8 or 9 this year. I have to find and decide where we'll get together. I asked them for their suggestions but they left it to me where to meet. I'll be responsible for the place. It's a tough decision. I don't have enough ideas about the downtown, so I decided to pick up the free information magazine, which is shown below. I don't know what they call such kind of magazines in English. I figured out "free information magazine" now by myself. Is this a suitable expression? 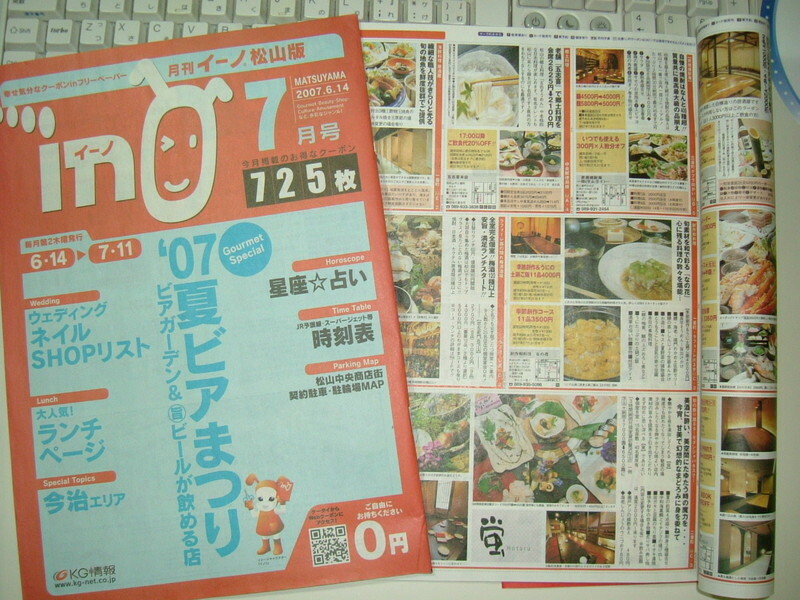 These magazines are delivered freely in the streets, stations, hotels, ,,any place where people gather and they contain many discount coupons. We can use these coupons by cutting them out of the magazines. We Japanese call it a "Free Paper". Of course, I know that it is a Japanese-made English term. If you know the correct expression which describes these kind of magazines, tell me. The party will be held on July 28th. I'm going to post pictures of us here. Don't miss it! At first I'd like you to look at the picture. Do you know what it is. 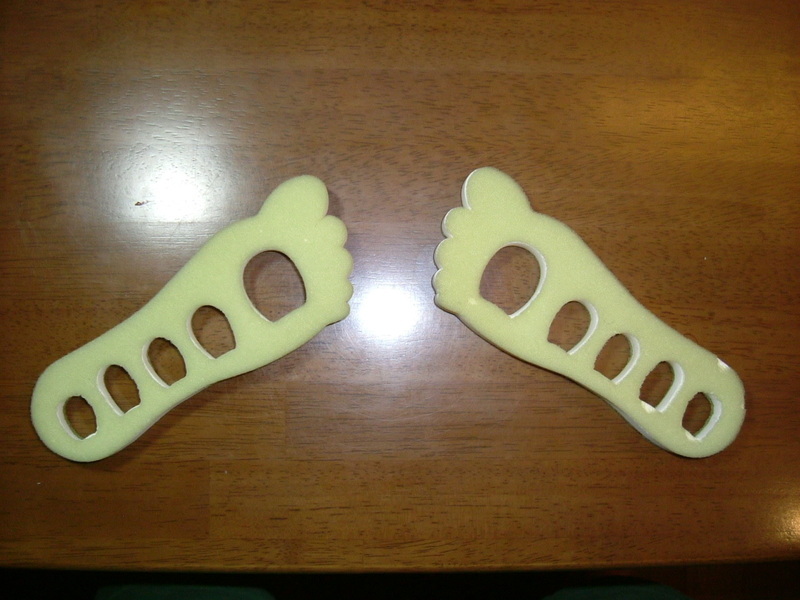 These are soft spongy foot-shaped plates that have 5 holes each. My youngest daughter gave me these. It seems like they are the goods for relaxing. I tried them immediately. As you can see in the picture, I put every toe in the holes. I felt unusual and I can't find a suitable word for expressing this feeling, anyway this feeling is not bad. 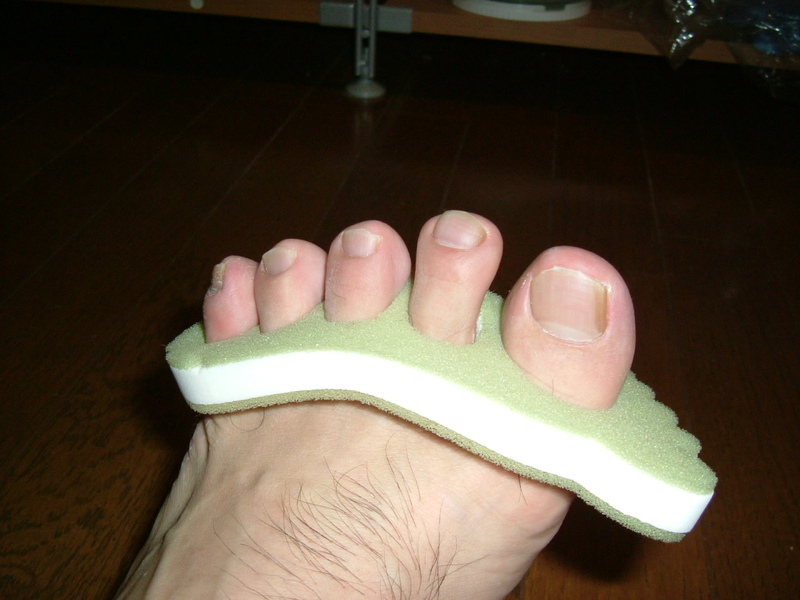 The space between the toes is made open and well-ventilated. It will prevent me from catching trichophyton or other skin diseases. While I was watching a TV drama with this on, I drifted off. It might be effective for relaxation. I admire the Vietnamese attitude in the stadium. Vietnam is one of the southeast asian countries. I hope that peoples of specific asian countiries (China and both Korea) emulate Vietnamese behavior. I went to Kumakogen town that lies next to the south of Matsuyama city. "Kogen" of Kumakogen means highlands. 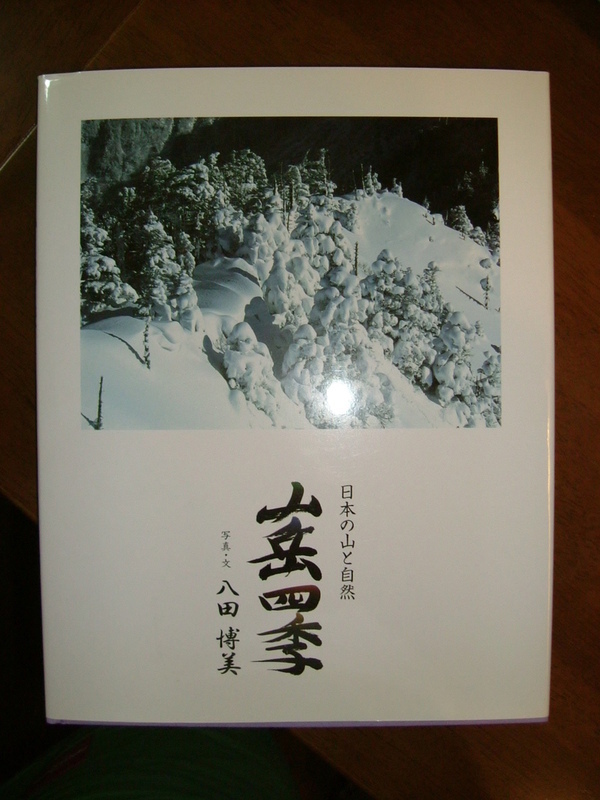 Kumakogen is higher in altitude than Matsuyama city. The one-hour drive to Kumakogen was comfortable and the greens around me were shining with dew from the rain just after the passing of the typhoon. My climbing buddy is holding a photo exhibition here this month. 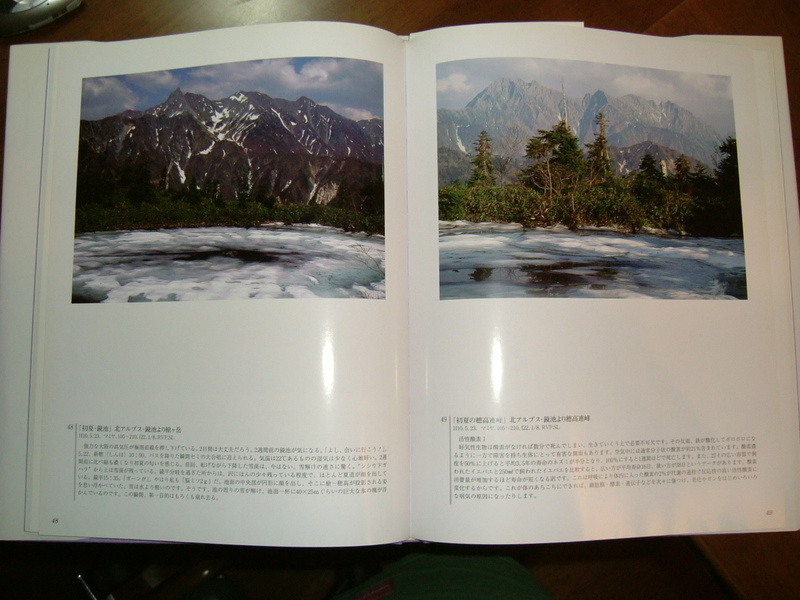 He has been taking pictures of mountains in Japan for more than 20 years and released his first photo collection a couple of years ago. I'll show you his first photo album here. We and other guests were enjoying chatting about climbing and skiing over a cup of coffee. It was very relaxing. I hope that he will be popular in Japan. 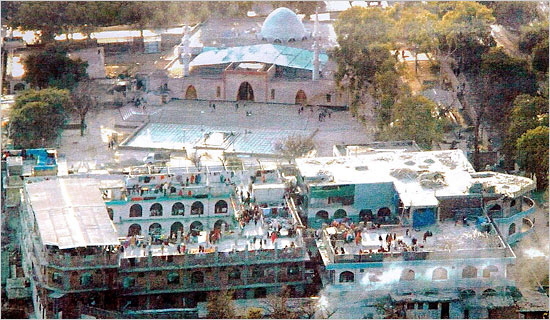 China was deeply and closely involved with the mosque siege in Pakistan. It's been raining for 1 week. The reservoir is overflowing. There is enough water. I can't believe that I was afraid about the drought this summer 2 weeks ago. All or None! Something seems to be off in nature. 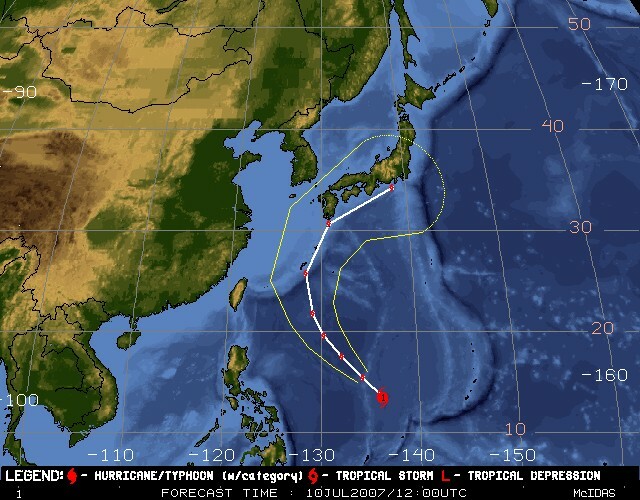 The JMA official says that the typhoon will stimulate the rain front and make it dump heavy rain, so take care! The picture shows my dog, Mocha, on a rainy morning. He looks a little depressed. He doesn't like to be on the chain, but I don't like to be jumped at. 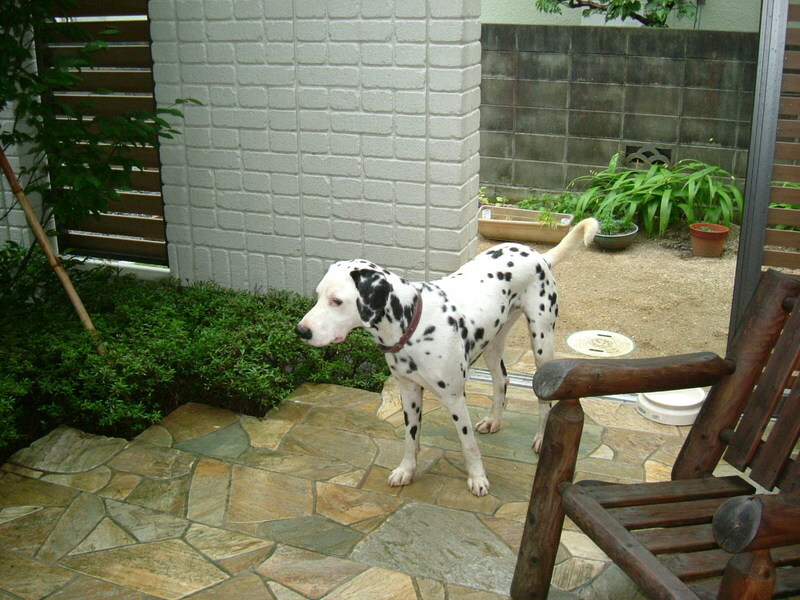 Though taking a walk in the morning is his routine, if I don't have enough time or don't feel like going, I let him wander free in the garden while I clean his space up. He likes to run about at full speed in the garden. It's cloudy this morning and sometimes rains heavily. If I free him, he would be happy and would run about and jump at me with joy. He would be muddy today and my clothes too. That's why he is on the chain. My friend dropped in at my hospital with gifts today. She did a three day trip to Okinawa. Okinawa had a miserable history in World War Two, but now it has become one of the popular sightseeing places in Japan. The gift is the famous distilled spirit, Awamori. I like it. You can see the bottle and the package in the picture and one other thing, the small bottle on the left. What is it? 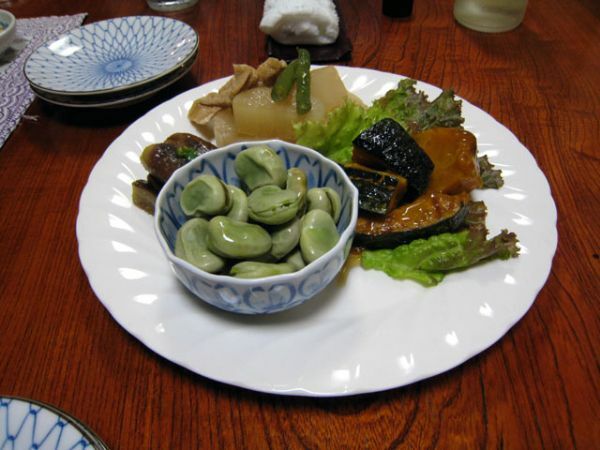 It is written on the label that Okinawa-produced peppers are pickled in Awamori. In short, pickled peppers from Awamori. 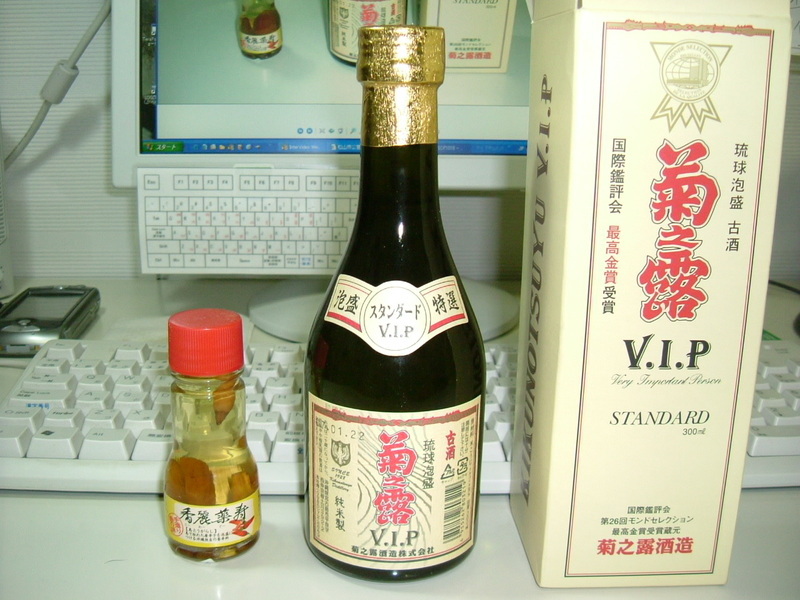 In this case we eat peppers based on common sense, but the label says "Sprinkle this on noodles, like soba, ramen,,,. Wow! We eat Awamori, not peppers. What will it taste like? Finally we got enough rain. In general it is the rainy season from June to the middle of July in my hometown. The water we need in the summer must be stocked in the reservoir and underground during this rainy season. However, we got little rain this year and the usage of the swimming pools of the elementary schools had already been prohibited by the city since a few weeks ago. This week it began raining and it has been raining heavily every day. The prohibition of the usage of the pools was lifted. This is good news, but why too much or none on careful thought? A farmer has been missing for 2 days after he went out to his rice field in my city. He might have fallen into the swollen stream. We need moderate rain. 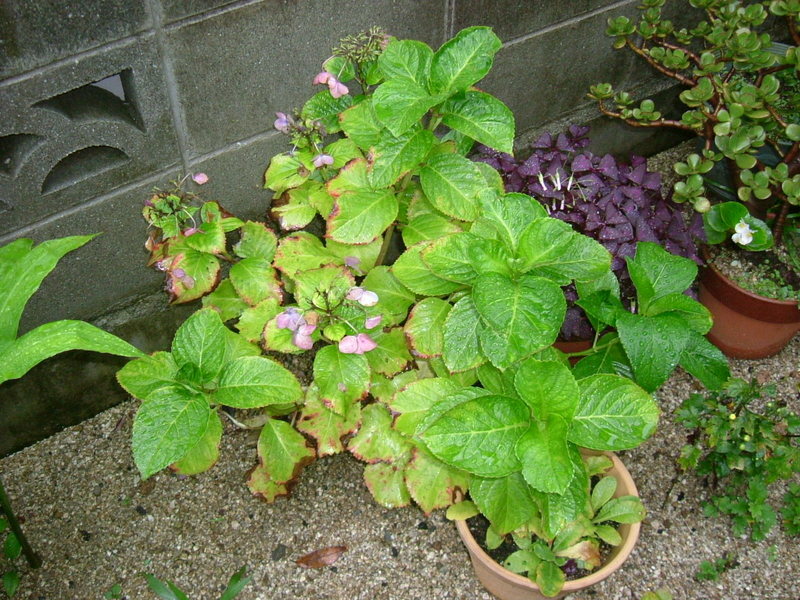 The picture shows the hydrangea in my garden that was beautiful in the moderate rain. Why "was"? Yes, the heavy rain drops ruined its beauty. I'm afraid it might be due to the change of climate. I think that Japan is stronger against natural disasters than any other country, but the southern part of Kyushu is covered with ashes from a volcanic eruption and isn't stable against heavy rain. The TV news announced that the torrential rain washed 4 houses away. 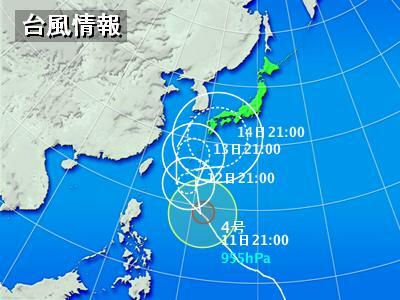 Though the death toll is none in Kyushu, it will take many days to restore it to its former state. In the entry I wrote, "I think it will disappear from the store shelf soon." Exactly as I wrote in the entry above, that instant noodle disappeared after a while. It must have been unpopular. 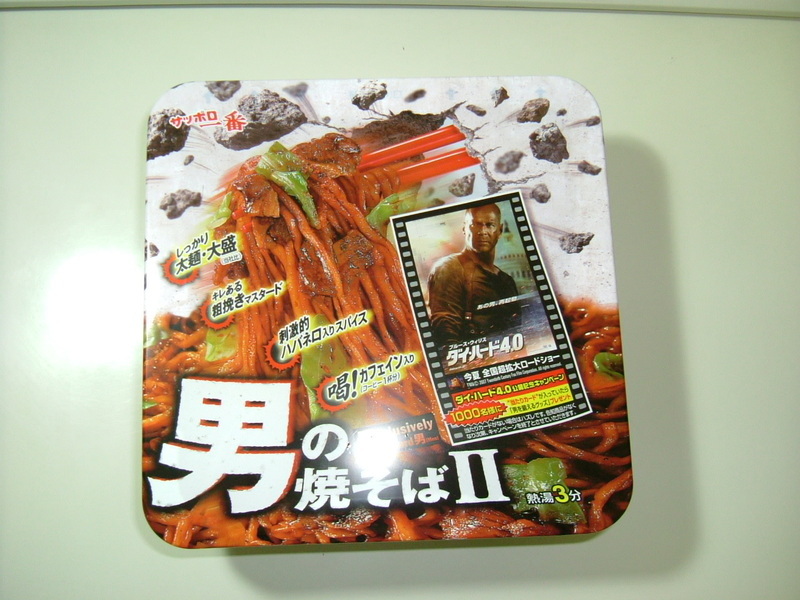 However, I found a new type of Man's Noodle at the same convenience store today. When I bought the noodle last time, the price was unreasonably low. I'm not sure, but the store owner wanted to clear out the stock and I fell into his trap. By the way, take a look at the picture below. The word "Die Hard 4.0 and Bruce Willis" caught my eyes. "Why is he on the package of instant noodles?" It was special sales campaign. If the winning ticket was in the package, you win! You'll receive the goods that makes and trains men. (I don't know what it is.) It might be a kind of trainer or cosmetics for men. Bruce is a hero among men in Japan too. .... and I tried it just after I had written the above. The taste was a little improved but it was not good for me. I realized that I will never learn. Japan is a very safe country, though some shooting incidents occured recently and the number of crimes that are committed by foreigners is increasing. That is something that the Japanese people can be proud of. The crime rate in Japan is exceptionally low among the industrial nations. The fact that the crime rate constantly decreased during the 50s, 60s and 70s, the most hectic years of industrialization and urbanization, is a "miracle" to the eyes of foreign observers. There are a number of reasons. The Japanese are ethnically and culturally a homogeneous people. They are not divided into classes. They have a high educational standard. The dropout rate in secondary education is as low as 2%. Gun control is strict and effective and there is virtually no availability of firearms among ordinary citizens. The drug problem is minimal. They live in a society of collective responsibility, so to speak, where one person's disgrace is the disgrace of those who are related to that person. This picture shows a koban that covers the area that my house is located in. Every Japanese knows the koban, but I think that the koban is not familiar to foreigners. 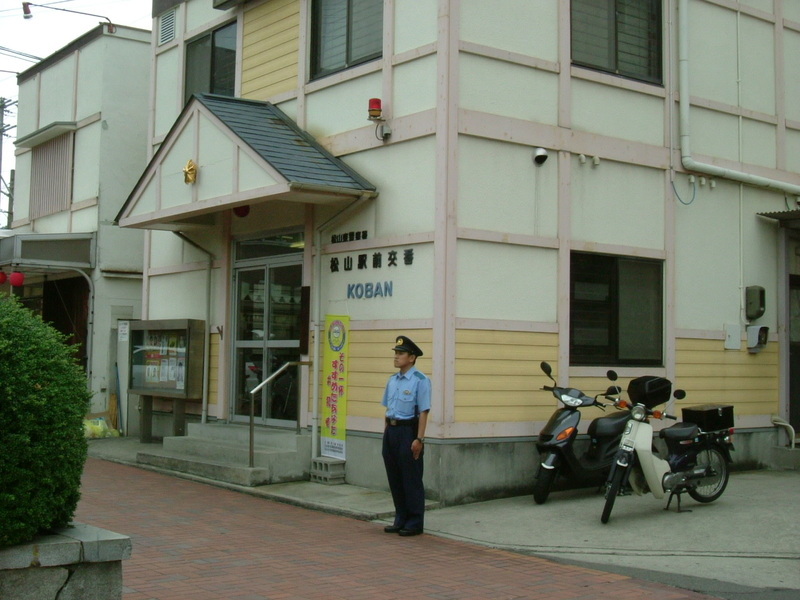 A koban is a police box or a fixed police post. David Bayley, who did an excellent comparative study of police in Japan and the United States wrote: "Unlike the United States, police operations in Japan have not been organized in terms of the patrol car. Fixed posts outnumber patrol cars...almost five to one." The kobans are all over the country. 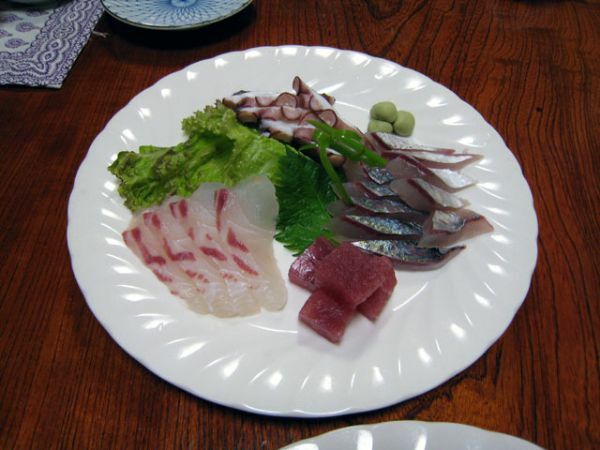 Again according to Bayley, "There are about 5800 kobans in Japan....kobans serve small, very densely populated areas. In metropolitan Tokyo, for instance, where there are approximately 1000 kobans, the average area covered is about 0.22 square miles containing a population of 11500 people." In rural areas there are fixed posts called chuzaisho. The major difference between koban and chuzaisho is that the personnel of kobans changes its shift, whereas the chuzaisho is both a fixed post and home for the police officer on duty. He lives in the community with his wife and family.